Former Cardinals manager Mike Matheny is joining the Royals' front office in an advisory role. As the Kansas City Royals begin the process of making improvements for the 2019 season, they’ll be seeking the advice of former major league catcher and manager Mike Matheny, who was let go in St. Louis earlier this year after six-plus seasons as the Cardinals’ skipper. The Royals announced Friday that they have hired Matheny as a special advisor for player development. The 48-year-old will assist in several areas of the baseball operations department, including scouting and player development. Matheny spent 13 seasons in the majors as a catcher, playing for Milwaukee, Toronto, St. Louis and San Francisco. He then served as a special assistant in player development for the Cardinals before being named manager on November 14, 2011. During six-plus seasons at the helm, he became the first manager in major league history to reach the postseason in each of his first four seasons managing. Matheny had a winning record in every season, finishing with a 591-474 career mark for a .555 winning percentage. During his playing days, Matheny made his big league debut with Milwaukee in 1994 and was a Brewer through ’98, then spent a season with Toronto (1999). He joined the Cardinals in 2000 and spent five years behind the plate for the Redbirds, going to the postseason in three of those seasons, including the World Series in 2004. His playing career was capped with two years in San Francisco (2005-06). 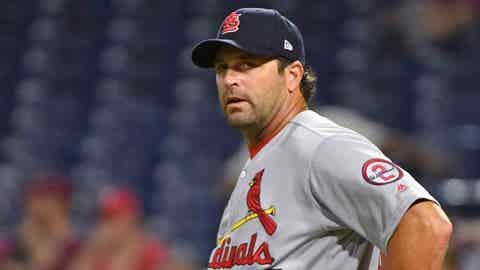 A defensive specialist, Matheny was a four-time Rawlings Gold Glove winner while setting the receiving record for consecutive errorless games (252) and consecutive errorless chances (1,565), a mark that has since been broken.